Creating products with a strong message, lines, emotion and direction. Both a design office and studio, Style & Design encompasses every new product development stage, including the manufacture of prototypes. The Style & Design designers combine aesthetics and technological performance, focusing in their projects on style and innovation, without ever losing sight of the new experience a new product should elicit for its user. Mainly aimed at luxury, the aviation or car industries, the office still works with private clients to personalise their goods. 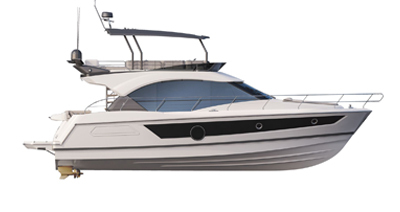 When they met with Beneteau, in 2010, this gave rise to the new flyer range: a first step in the nautical industry that had a lasting effect on traditional outboard motorboat codes and their development. Romain Chareyre : We are a team of 120 people at Style & Design. Designers, conceptual designers, modellers, experts in plastics technology, sheet metal formers, and painters, all passionate about their work, combine their expertise to give birth to new concepts with high added value. We offer a pragmatic and efficient development based on the combination of design and functional experimentation. We can also confirm how ergonomics, use and design operate in reality. Outside of the Beneteau project, one of my favourite projects was a confidential one that we developed for an airline. Our role was to redefine and revisit the passenger experience in business class and make significant developments. It was up to us to redefine travelling while respecting layout restrictions. It was a triple technical, stylistic and functional challenge. This is the kind of general project that we like that has the real ambition of gaining market shares for our client. We were able to develop a new design approach that we have been able to adapt to other clients in other fields. Consulted in 2011 for the creation of the new flyer range, Style & Design immediately chose to create a strong identity. The concept of three deck plans for the same hull resulted in the creation of 10 highly innovative models from 5 to 8 metres. Romain Chareyre : The Flyer 8 SPACEdeck, the most recent addition to the range, shown at the Nautic 2015, is one of my favourites. Defining a boat of this size in this segment enabled us to make the best use of the range concept: spacious, convivial, functional, and with a very distinctive style. The Flyer range had to stand out to create a unique experience for the user. My favourite Flyers are the 5.5 SPACEdeck, for its fun yet functional appearance and the 8.8 SPACEdeck, because it allowed us to fully express the Flyer spirit. Opposites attract!